Faith and Theology: Megachurch worship: supersize me! 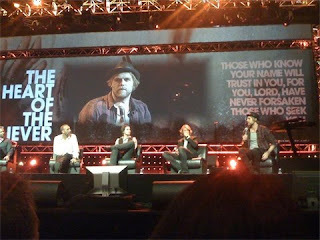 Earlier in the year I posted this piece about a visit to Hillsong. I’m reposting it here, since the Pentecostal theologian Shane Clifton has written a response which I’ll be posting tomorrow. But for me, the most interesting aspect of the service was the dominance of the screen. Every moment of the service, from start to finish, was broadcast on to huge screens around the auditorium. When the pastor spoke, he would address one of the many cameras. When the worship-leader spoke to the congregation, he would speak into the camera. Even the heartfelt altar call at the end of the service was addressed to the camera. During the worship songs, the screens would be filled with the faces of those gorgeously happy singers and musicians; then a camera would pan across the crowd of raised hands before cutting back to a shot of the worship-leader’s face, full of adoration and passionate sincerity. What made this so interesting was that the songs’ lyrics were also superimposed over these images; so if you wanted to join in singing, you had no choice but to turn your face away from the altar (if there had been an altar), away from the congregation, even away from the flesh-and-blood performers on stage. In short, participation in worship was possible only through the mediation of the screen. The entire worship service was orchestrated primarily as an event of the screen, so that one could take part only by turning towards the screen and participating in its projected images of worship. The Protestant reformers used to complain that the Roman Catholic priest was “doing worship” for the whole congregation, standing in their place and performing everything on their behalf – and a similar complaint is often made about today’s Pentecostal megachurches. But I think the function of the screen raises a much more interesting problem: not merely that the congregation is worshipping vicariously through the onstage performers, but that the entire worship event is actually taking place onscreen. At this morning’s service, even the worship leader himself was not a direct participant in the worship event – the real worshipping subject was his onscreen image. The flesh-and-blood performer participates in this worship only indirectly, through a vicarious participation in his own projected image – a larger-than-life image which becomes the bearer of transcendence. Similarly, the congregation is involved in worship only vicariously, through the mediation of the screen. This is an instance in which the screen comes to possess more ontological depth than the flesh-and-blood world itself; the projected image becomes “more real” than reality. In the same way, towards the end of the church service I glanced down from the vast screen, and for a moment I glimpsed the flesh-and-blood pastor speaking passionately into the camera. It was strange to see the man standing there like this: a miniature version – touchingly flimsy and remote and insubstantial – of the real preacher whom I’d been watching on the screen. I felt embarrassed to have seen him like this – like the embarrassment of visitors at a hospital, who don’t know where to look – so I quickly averted my eyes, and returned my gaze to the big reassuring smile on the screen high above. For more on contemporary worship, see also The Pornographer’s Dream.